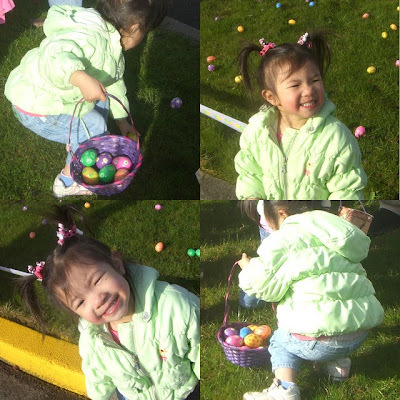 On Easter weekend (usually at the end of March), children can attend egg hunts. It was Little Chicken’s first year in picking up her own eggs without any help. Inside each decorated plastic eggs are candies. I did not know this until I researched it on the internet; The custom of an Easter egg hunt began because children believed that rabbit, a symbol of fertility, laid eggs, a symbol of new life, in the grass for them to find. But Easter Sunday is much more than a day of colorful plastic eggs and chocolate bunnies. As Christmas is celebrating Jesus’ birthday, Easter is celebrating Jesus’ victory over death. We had Easter breakfast, service, concert and an egg hunt after the service for the kids on Easter. This year the schoolkids didn’t paint any hard boiled eggs for Easter. Ah yes, I figured, better late than never. I wanted to introduce the significance of celebrating Easter. Posted this article late because I had wanted to share a lamb dish, a popular food during this occasion. Since, I never got around to the lamb dish, I reworked my draft and posted this instead. “Happy Wall” works just as well. Thanks for the encouragement. Our egg hunt was on a Saturday. And then, service was on Sunday. Painting hard boiled eggs is a fun project. My husband boss’ wife who is from Japan, drains raw eggs and decorate the eggs as her projects. The last time we went to her house, she had a few decorated eggs displayed. I can already tell that she is a patient lady by the amount of details that she put into those eggs.